It's raining again today in B.C. We're actually under a heavy rainfall warning. Well, it's winter after all and that's just how things are here. You accept looking somewhat grey and washed out for several months until the sun decides to visit again. It rains a lot here. After all this is a temperate rain forest. Another one of those "I didn't know that." facts that floats on the periphery of knowledge. Lots of people complain about the rain. Okay this time of year most people whine about it. 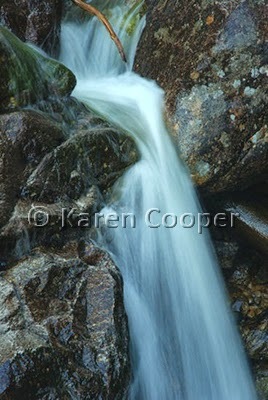 Rain gives rise to some of the most amazing displays of rivulets, streams, and waterfalls. And that's just running down your front yard. If you take the time to find a trail in the woods somewhere, you will find some of the most diverse displays of water I have ever seen. One day someone smart will give names to the different types of waterfalls. For me, I just love the sounds they make. I love the way they accept what they are and where they are going. No pushing and shoving to be there first, it's all orderly and directional. If they have to move around some object to move forward, then they do it. No whining. They will get to where they are going, may as well make some beauty along the way for those that care to look. They are peaceful and powerful at the same time. They can literally move mountains. With quiet determination at just being what they are. Harmony and grace with power. We humans have so much to learn.